Athletic Abs tells readers how to obtain washboard abs by performing a variety of activities. • Recommended for: weekend warriors, and others who can perform moderately-challenging exercise. 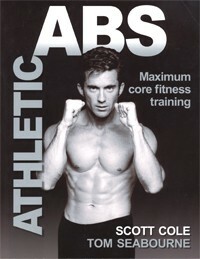 • Scott Cole is a nationally-recognized fitness instructor. (He is the star of "Abs of Steel.") He was once named one of IDEA's Top Five Fitness Instructors in the world. He has been featured in over 300 magazines and has appeared on many TV shows. • Tom Seabourne, PhD has also been featured in magazines and TV shows. His fitness interests include cycling and martial arts: he holds a 3rd-degree black belt in karate and taekwondo and holds several distance records in ultra cycling. He is certified by ACE and by ACSM. He teaches at Texas A&M University and Northeast Texas Community College. Cole and Seabourne incorporate a wide variety of exercises into their core strength program. Chapters 5 and 6 cover the classic core-strengthening floor exercises. While both of these chapters are well done, pages 94-96 demonstrate several floor exercises that I don't care for. Straight leg lifts while lying on your back tilt the pelvis forward, putting strain on the lower back. These types of exercises challenge the hip flexors more than the abdominal muscles. While the authors state on p. 93 that bending the legs, pointing the knees outward, and placing the soles of the feet together takes the hip flexors out of this exercise, the text and photos on p. 94-96 should reflect that approach. Nevertheless, chapters 5 and 6 are thorough and well done. These chapters alone contain 63 black-and-white photos of models performing floor exercises. Chapter 7 demonstrates exercises for the back. However, the authors only provide floor exercises; ie., it would have been helpful to also include exercises using a bench or while sitting in a chair. Alternating toe-touches while standing also seems like a beneficial exercise that requires no equipment. Chapter 8 focuses on lunges and squats. Chapter 9 is a curious combination of martial arts moves, yoga poses, and plyometrics. While I applaud the authors for being comprehensive, I think some readers are going to question how performing the "sticky hands" drill, for example, is going to improve core strength. Chapters 10 and 11 demonstrate exercises using medicine balls, stability balls, and aquatic drills. All of these chapters, like the others, contain well-done black-and-white photos. The authors also offer an extensive (32 pages) chapter on stretching. One of their main tenets is that flexibility is important for building strength. Stretching is, obviously, the way to improve flexibility. However, I feel they go too far when they make broad statements without evidence or support such as: "A tense or tight athlete seldom triumphs over a flexible, core-trained athlete." (p. 6), or, "...you will indeed experience more speed as your abs get stronger." (p. 6). Since the About The Authors page doesn't state what academic degree Cole holds, or, what field Seabourne earned his PhD in, statements like this need to be supported with evidence. Finally, there is not one demonstration utilizing a BOSU ball or fitness bands. While fitness bands may have been marketed after this text was published (in 2003), the BOSU ball was first introduced in 1999. • What I Liked About This Book: thorough, comprehensive, takes a unique approach to core strengthening, lots of good-quality photos. • What Could Be Better: add exercises using BOSU ball, fitness bands, chair exercises. In general, I like this book. While it is obvious that both authors have a fondness for martial arts, the inclusion of some of these moves does not detract from the book. I especially like the fact that the authors stress flexibility and cardio training. I feel too many weekend warriors still believe they can obtain ripped abs simply by doing crunches. Following Cole and Seabourne's program will produce not only better results in the mirror, but, also, lead to improved fitness in general.